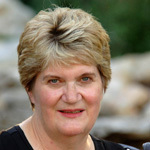 Julie Coulter Bellon specializes in international intrigue novels. Her latest, All Fall Down, is set in the Middle East and begins with a hostage situation. Rafe, who is recuperating from a serious knee injury is a Navy SEAL. He arrives at his father’s company for a meeting with his brother who is running the business while their father is in the hospital and is almost immediately taken hostage by an old friend and fellow SEAL, Gary Holman. Claire is a hostage negotiator who is called in when a bomb threat arrives at the headquarters of an international research company. A man with a bomb vest strapped to his body is holding a hostage at gun point on the roof of the company headquarters. The man with the gun repeats an old nursery rhyme over and over: “Ring around the rosy, a pocket full of posies, ashes, ashes, we all fall down.” She doesn’t know what the rhyme signifies, but she soon realizes the man with the gun is somehow also a hostage. The rhyme sends chills down Rafe’s back. It was a signal used by his SEAL unit during a recent confrontation with an extremist group led by an obsessed terrorist who for some unknown reason was released from Guantanamo. The last line was a signal to clear an area because a bomb was about to explode. Claire knows she must be on the roof to negotiate the release of the hostage and to determine what is really going on. Her superiors feel it would be too dangerous for her to go up. When she is finally granted permission, her suspicions are confirmed that she is in fact dealing with two hostages who are being manipulated by someone who is communicating with the man holding a gun and wearing a bomb vest. He is also holding a cell phone and receiving text messages. She soon realizes that the person controlling the hostage taker is close enough to observe her and the two hostages. She attempts to communicate directly with that person also via text message. Sniper fire erupts and Gary makes an attempt to save Claire and Rafe as well as others in the area by sacrificing himself even though he knows his action will detonate the bomb. Kidnappings, terrorist threats, confusion over who to trust, explosions, and the added element of personal and family dynamics keep the plot rolling at breakneck speed. The fiction arc is well developed and though the whole book is suspenseful Bellon skillfully advances the action with scenes that move the story forward, resolves some questions along the way, and ends with a combination of high drama and personal impact choices. The characters are sketchy in some areas, but are well-developed in areas pertaining to the story. We don’t see them as completely whole people and know little of their backgrounds. Even though All Fall Down is not a character driven novel, there are several scenes where characters must make decisions that reveal a great deal about the character and their inner values. These scenes highlight major steps in these characters’ growth. Julie Coulter Bellon has taught journalism at BYU for fourteen years which has kept her on the cutting edge of world events. She also travels a great deal to research the settings for her books which gives them an authentic feel. She lives in Utah, is married, and is the mother of a large family. All Fall Down is her eighth published book.